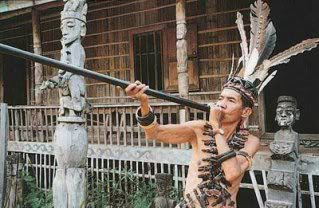 Blowguns are a part of the history of many ancient civilizations due to the accuracy and power this primitive weapon possesses. Compared to other early weapons, the blowgun has distinct advantages due to the distance it can carry with little effort and noise produced. An animal is struck by the dart from a long distance away before the light thump sound can be detected. Today these guns are used for both hunting and fun target shooting. With a few basic techniques, you can learn how to shoot one just like ancient tribes that hand crafted their own. Learning how to shoot a blowgun requires more than just sticking a dart in the end and blowing through it. There are proper loading, holding, aiming and breathing techniques that you should follow in order to master your shot. First, locate the front pointed tip side of the dart and insert it first into the mouthpiece on the gun. Take precaution to ensure this pointed tip is going in the right direction when loading the ammo. The back of the dart should fit snugly into the bore of the gun just past the mouthpiece. If done properly, this will limit the resistance and friction as the dart travels through the weapon. If you don't push the dart in just far enough, your breathe may not even have enough force to push the dart through. You also don't want the dart to be so far into the gun that it falls out when you angle it back downward. Practice how far you can put the dart in without it falling out to ensure you are doing it right as this may vary from gun to gun. To properly hold a blowgun, both of your hands are required to stabilize it. Your dominate hand should be placed comfortably about a quarter of the way down the barrel with your other hand extended out further down the length of the barrel. This will ensure you have adequate support across the entire length and will help increase the accuracy of your shot. Much like holding a rifle, keeping a steady, firm hand grip is essential to the aim of the weapon. Also, you will want to close your non-dominate eye which will allow you to better focus on your target. Typically people who are right handed also have a right dominate eye. To figure out which is your dominant eye, point your finger at a distant object with both eyes open. First close one eye and then the other. Your finger should continue to be lined up with the object when your dominant eye is open. Some blow dart guns have a sight at the end of the bore that you can look through with your dominate eye to center your target through the cross hairs. However, if your target is far away or moving, you will need to adjust your aim to be above and in front of your target so it is in the right place when it lands. Each gun will travel a different speed and distance depending on the strength of your breathe. It will also be impacted by the length of the barrel. The longer the barrel and the stronger the breath, the better you will be at shooting. Make sure you are completely filling your lungs with air and then put your mouth up to the mouth piece. Hold your breathe until you are properly sighted in and blow into the mouth piece with force to fire. Make sure you let all the air completely empty in your lungs when shooting. Much like a follow through in golf, this will ensure you have the longest flight path possible.